Rogue Wizards is a solid casual roguelike with unique monster designs, perpetually generated dungeons and 10-12 hours of story-mode gameplay. Dungeons themselves are challenging and fun, requiring a bit strategy to defeat monsters which utilize truly unique and interesting attacks. While the boss battles and AI are a little lackluster, the ability to teleport within floors, bonuses for defeating all enemies, and the replayability offered by the Gauntlet mode make Rogue Wizards a good investment for the small price tag of $15. Light and simple isn't a bad thing, but Rogue Wizards is too light and too simple, and a tad too slow for its scaled-down design to feel deliciously more-ish. While it's not bad, it didn't leave any real lasting impression barring a mental sigh at what could've been. While its story and approach play it safe, the smooth gameplay and optional “perma-death” Hard Mode still bring plenty to enjoy. With a wide variety of weapons and spells to choose from and a unique experience behind each randomly-generated door, it keeps things fresh without stepping too far outside of established comfort zones. The random nature of so many of Rogue Wizards' elements guarantees experiences that are dynamic, but the repetitive core gameplay and tedium of inventory management can also make them monotonous. The Story mode's narrative doesn't add anything to make the gameplay more compelling, so you may be better off with the Gauntlet mode's endless dungeon. Either way, this game works best in casual play sessions. Only for the most devoted roguelike fans who want a quick fix. 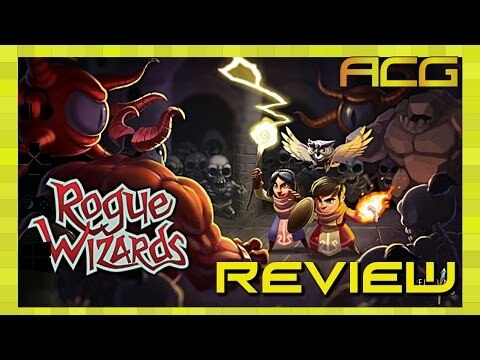 Rogue Wizards is a fantastic roguelike dungeon crawler that delivers fun and challenging gameplay with a mildly interesting story. The gauntlet mode provides a lot of replay value and although the game has some issues, the attention to detail enhances the simple yet strategic gameplay to a real gem of an indie game. The biggest frustrations with Rogue Wizards come from the incredibly steep grind that exists right from the outset. While the movement controls are a bit sticky and choppy, the weapon and spell variety is a lot of fun to experiment with, and the changing nature of the dungeons really allows for a lot of variety, even while grinding. Unfortunately, the tedious nature of the combat and the immense number of dungeons that will need to be cleared simply to advance makes it a tough sell for those not devoted to the climb. There's a lot of good ideas here, but the execution is just a bit lacking. All in all, I'm conflicted about Rogue Wizards; I want to love it, given the brilliant art, fluid combat, and addicting gameplay, but if it's just going to sit on my PC...Then it's just going to sit on my PC. The sterile soundtrack and similar environments, along with bosses only being upgraded enemies only screams repetitiveness; I want to see where the game will go with it's story and gameplay, but already only two hours in, and I'm already feeling the slog. Are you ready to go be the chosen one again? Me neither. I'm kinda weary of always having to go save the princess, then finding out she's really in another castle. There's a bit of Aladdin in this as well, as the protagonist just happens to be a street rat who hasn't eaten in two days. But! All tired cliches asid, this RTS is enough like Diablo (to the extent that they even swiped the treasure gnome) to keep you digging through the dungeons for better gear. Rogue Wizards does a lot of things right, taking the best elements from two really good genre of games. Town building, looting, dungeon crawling and more will have you back for more fun each and every day. Though the combat sometimes suffers from troubles and the character customization is a tad lacking, Rogue Wizards seems to shine through where other rogue-likes cannot.